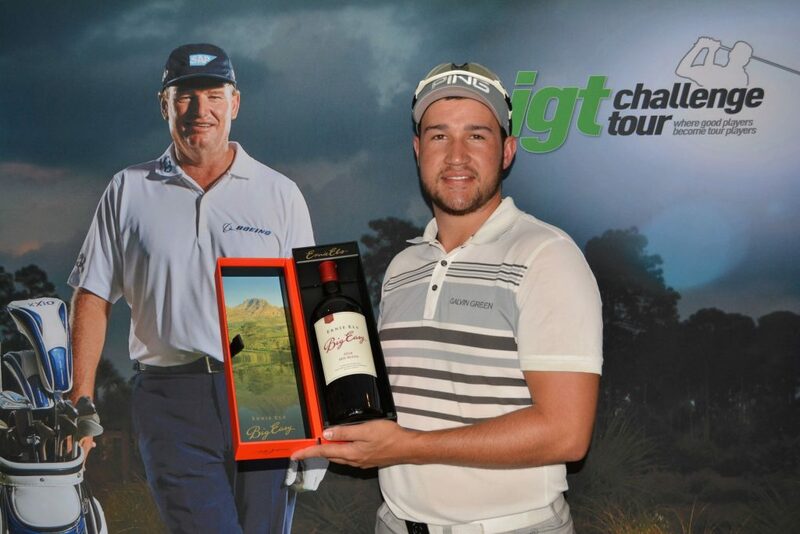 JOHANNESBURG, 28 November 2018 – Sunshine Tour rookie Thriston Lawrence claimed his first professional title with a cool performance in the Gauteng heat in the 15th event on the Big Easy IGT Challenge Tour on Wednesday. Rounds of 65 and 69 set Lawrence on the road to glory heading into the final 18 holes and the joint overnight leader navigated the Parkview Golf Club course in seven-under-par 65 to secure his maiden victory on South Africa’s golf developmental tour. Sharing pole position with two-time champion Matt Bright and with at least six players within striking distance going into the final round, the 21-year-old Lawrence said after the second round that ‘anyone could win it’. In reality, he never gave anyone else a chance. The Nelspruit golfer took the sole lead on 10-under with a birdie start after Bright bogeyed the par-five opening hole and when Bright’s bid for a hat-trick imploded with a nine at the par four fourth, Lawrence pulled even further clear of the chasing pack with gains at four and eight. The chasing pack did their best to drag Lawrence into a dog fight. Pretoria golfer Albert Venter started the back nine with a flurry of three birdies and reeled in another trio of gains from 14. Louis Albertse from Dundee made a pair of birdies at 13 and 14 to grab a share of second and Johannesburg golfer Jason Roets produced three birdies on the back nine in an attempt to close the gap. It was all too little, too late as Lawrence responded with four birdies on the bounce from 11. It looked like he was going to run away with it when he moved to 16-under and five shots clear with four to play, but he gave back a shot at the par four 17th. The bogey was academic. No-one had done enough to put any real pressure on the leader and he tapped in for par at the par-four closing hole to cement victory on 15-under 201. Lawrence was delighted to secure his first triumph and a four-year wait for a pro breakthrough. “I’ve had a really solid first season on the Sunshine Tour, but I’ve often felt that I should have won already,” said Lawrence. “They say that if you win 20 percent of the time, you’re the best golfer in the world, so I’m very relieved and satisfied to get this win under the belt. “A win is always special, irrespective of where you achieve it. You try to be patient and wait for it to happen, but you do start doubting yourself and I feel like I’ve crossed a huge hurdle today. It’s really satisfying to get it done down the stretch is a great feeling. “I made a good bogey at seven after I misjudged the wind on 17 and hit my tee shot too far right. It was a good drive, but it clipped the trees. I had to punch out with an 8-iron and left the second short. Didn’t hit a great chip and had to two-putt for bogey. It was pretty much the same with the bogey at seven. “Making four in a row on the back nine definitely boosted my confidence. I hit 5-iron down the middle at 11 and planted a sand-wedge six feet from the hole. I hit it give at 12 and my eagle putt at 13 just lipped out. And I holed a long putt at 14 after a tough chip to the green. Venter signed for 68 after a late bogey at 17 and settled for second on 10-under, while Albertse finished a further shot back after a final round 71. Roets also shot 71 to take fourth on eight-under. Amateur pair Keelan van Wyk and Robin “Tiger” Williams from England posted a pair of 67s to share fifth on seven-under with Gary Player School of 2018 member Makhetha Mazibuko, Luke Brown and last year’s IGT Challenge Tour Money List winner Ruan Conradie.